Santa Rosa Junior College Culinary Arts Center, 1670 Mendocino Ave., Santa Rosa. In the warmer months, the cafe opens its patio area with outdoor grill, smoker and pizza oven. For now, booking a reservation in advance is recommended at 707.522.2796. 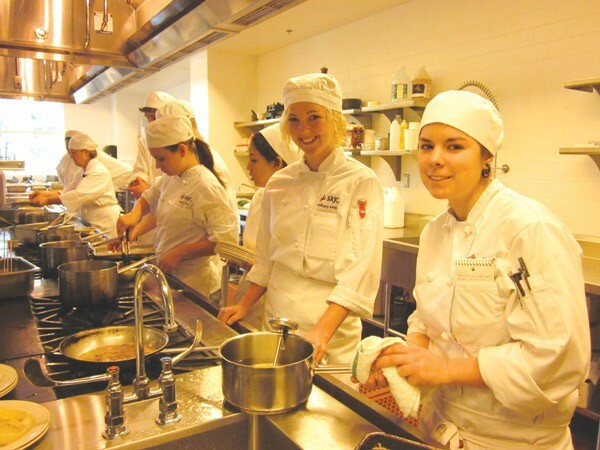 ON THE LINE Roughly 300-400 students are enrolled in the SRJC's culinary program. What's a chef to do when presented with 60 gallons of chopped cabbage that must be used as soon as possible? At the Santa Rosa Junior College Culinary Institute, such superfluity is a weekly occurrence, as students in knife class learn the cuts of the trade by slicing and dicing pounds of fresh produce. But instead of going to waste, these expertly chopped ingredients become part of the weekly menu at the SRJC's brand-new Culinary Cafe, which serves gourmet food at shockingly affordable prices. No wonder it's so hard to get a seat. Now housed in the impeccable $20 million B. Robert Burdo Culinary Arts Center, directly across from the JC campus, the cafe occupies a windowed dining room that abuts an open kitchen agleam with stainless steel equipment. When I arrived promptly at 11:30am on a recent Wednesday morning, I was handed a to-go menu with a phone number printed at the bottom. "We're totally full," said Betsy Fischer, instructor of front house operations. "You can call to make a reservation." When this tactic proved fruitless (Friday was completely booked as well), I realized I'd need to be more tenacious if I was to eat at a restaurant that's open only seven and a half hours a week, from 11:30am to 2pm, Wednesday through Friday. Even with such specific hours, it's easy to understand why they're serving a hundred people a day. "Our menus are more complex than restaurants'," chef Michael Salinger, program coordinator and instructor since 1993, tells me. Twenty-six students make all of the food, from scratch, using produce from the JC's own Shone Farm. "Each week, you can expect something grilled, stewed, roasted and sautéed," he explains, "which reflects the variety of skills my students are learning." The cafe's aesthetics—black leather chairs, creamy linens, stylish light fixtures, white-clad cooks-in-training—belie the menu's prices, where no item tops $10. In addition to seasonal soups, salads, pizzas and sandwiches, entrées run from pan-roasted pork tenderloin and grilled beef satay with peanut sauce to winter vegetable potpie and shrimp kebabs with tropical fruit salsa. Those who can't make it for lunch can stop by the bakery, which opens at 7:30am, for a dizzying variety of sweet treats. Enormous pieces of fresh cake—German chocolate, lemon chiffon, angel food with raspberry chantilly—sell for just $2.50, less than what most coffeehouses charge for their saran-wrapped, often disappointingly cold and spongy versions. A coconut macaroon is just 75 cents. When he took over, Salinger revised the program to guarantee that students would be job-ready in just two semesters. Certificates in five programs—culinary arts, baking and pastry, front house operations, dining room service and restaurant management—carry a $2,500 price tag, a fraction of the cost of most culinary schools. "When I started, we had about 16 students working toward certificates," Salinger tells me. "Today, we've got 300 to 400 students." He credits the rise of the Food Network, with its attendant glamorizing of chefs, for the sharp increase in popularity in the last decade. "Plus," he points out, "we still have jobs in our industry."